With a little elbow grease and a lot of ingenuity, a new Alberta business is churning out biodegradable auto parts made from wood, hemp and flax. The BioComposites Group creates car panels out of natural fibres, like hemp, flax and wood. (Alberta BioComposites Group) With a little elbow grease and a lot of ingenuity, a new Alberta business is churning out biodegradable auto parts made from wood, hemp and flax. The BioComposites Group plant, located on Drayton Valley's Bio-Mile, uses a one-of-a-kind manufacturing process to make door panels, kick pads, cup holders and dashboard panels. 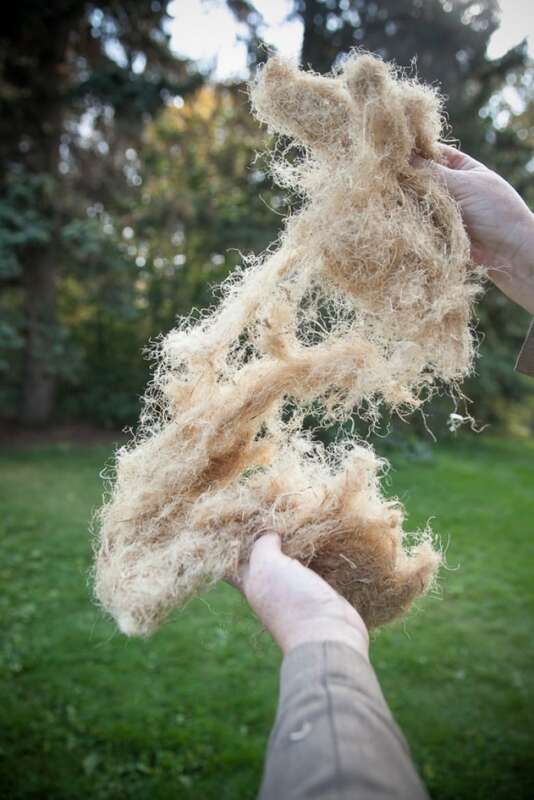 "We take waste wood fibre and waste agricultural fibers, and then needle them together with a process that creates a mat that is used for interior panels," said Dan Madlung, CEO and co-owner of BioComposites Group. The lightweight panels are then shipped to the United States, where they are pressed then passed along the manufacturers. Madlung, along with his wife and business partner, Brenda, have been up and running now for more than a year. The panels are already being tested in a few high-end cars, Madlung said, including BMW, Audi and Mercedes Benz, and in large trucks like Kenworth and Peterbilt. And he hopes their product will one day make fibreglass and plastic components obsolete. "And it's very big for Alberta, in that every acre of hemp that we use sequesters five times as much CO2 as a forest does. So it's pretty big for the environment." Madlung said on an interview with CBC Edmonton's Radio Active. They've shipped out a couple of truckloads so far, and are expecting permanent customers to come online within the next month. But it hasn't been easy to get a foothold in the industry. It took years to get the business off the ground, but after $12 million of their own private funding, $4.5 million from Alberta Innovates Bio Solutions, and investment from Ottawa's Investments in Forest Industry Transformation initiative they are finally gaining speed. "Its an interesting marketplace because auto makers are very cautious and we're the only plant in North America that produces this type of material," Madlung said. "So the product development phase on this very substantial and lengthy." But once their production lines start pumping at full capacity, Madlung expects $5 million in annual revenues for the company. "It's a really big opportunity because hemp and flax are grown pretty well 100 per cent for their seed. So they cut the top two inches off the plant and you have that in your cereal," said Madlung. "But what we use is the stalk, and that's a 100 per cent waste product right now. So we take that stalk and we pay the farmers for that, and the farmers get that extra revenue. The lightweight products are coveted by manufacturers because they help with fuel efficiency and their environmental footprint.